Browse: Home / 5-Star Reviews, 5-Star Fraud. Are You Ready to Pay the Price? Go about reviews the right way and you’ll earn respect and trust in the process. Cheat and you risk everything you’ve built. When early technologists first created the framework for the internet, few understood how vital it would be to build trust and stand out in an expansive sea of hundreds of thousands of businesses, all moving in unison to establish an online presence. Today’s entrepreneurs, in contrast, understand this problem so well that they've inadvertently set off an arms race for those coveted five-star reviews. Moving forward, how businesses obtain their stars is going to be more important than how many stars they have. Businesses face a litany of new defenses, processes and technologies, as review companies move to protect their platforms from manipulation. 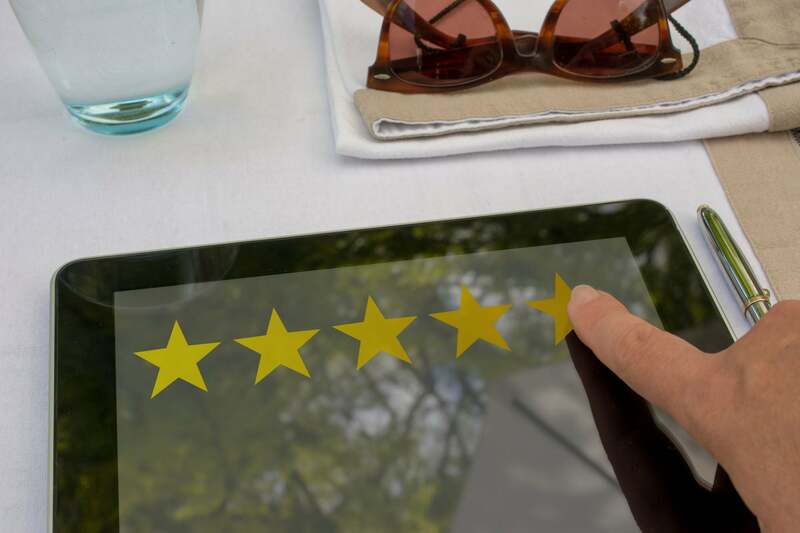 In short, companies that aim to manipulate or "game" the system to get fake five-star reviews face new defenses instituted by online review platforms. These defenses include such technology as machine learning algorithms, artificial intelligence and compliance processes. Still tempted? Consumers will happily expose bad actors, and any business caught might never recover. The new state of online reviews, then, is that a line has been drawn in the sand. Here’s how you can be sure you’re on the right side of that line. Review platforms — like mine — are investing in AI and machine-learning to detect fake reviews, but no platform is perfect. It’s a constant challenge to snuff out fraud and manipulation. But here's the thing: You should join the fight. If you see something suspicious, report it. It's not hard to find out where to report it: Google allows businesses to flag content that might be in violation of its terms of service. TripAdvisor offers a similar feature. Use the tools available to you if you suspect a review is fraudulent. In some cases, that may mean flagging a five-star review that was mistakenly posted about your business when it was really meant for someone else! Use flagging tools as they were intended; over-reporting/flagging negative reviews to manipulate your way into a better rating is a surefire way to lose credibility … and revenue. Plus, new technologies are likely to catch you. Businesses should not avoid responding to negative reviews. Taking ownership and being accountable and approachable signifies an organization that is open to learning and improving. There are plenty of guides that offer best practices on this. Talk to critics in a timely manner. … analyses suggested that improved ratings can be directly linked to management responses. And, perhaps surprisingly, we also found that when managers respond to positive reviews, it has the same benefits as when they respond to negative reviews. Using a closed platform is like asking your own mother if you’re handsome — you’re going to get two thumbs up, but does it really mean anything? Closed platforms let businesses selectively invite only their best customers, while some even allow businesses to unpublish reviews they don’t like. That’s a quick way to lose trust and credibility. Open platforms help remove some of the bias. Online reviews have come a long way since the dawn of the internet. Now, it’s time for businesses to look at customer feedback as an opportunity rather than a trophy. Each review is a chance for businesses to learn and improve. Go about it the right way and you’ll earn respect and trust in the process. Cheat and you risk everything you’ve built.